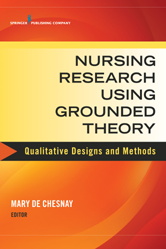 The book describes traditional and focused grounded theory, phases of research, and methodology from sample and setting to dissemination and follow-up. It encompasses state-of-the-art research about grounded theory with an extensive bibliography and resources. Varied case studies range from promoting health for an overweight child to psychological adjustment of Chinese women with breast cancer to a study of nursing students' experiences in the off-campus clinical setting, among many others. The book also discusses techniques whereby researchers can ensure high standards of rigor.